You don’t need to suffer from headaches. 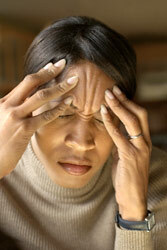 Over the years I have treated so many headache sufferers. 90% of all headaches are tension headaches and even many of the migraine headaches are really tension headaches even though they hurt so bad people call them migraines. Most of them originate in the neck even though they are felt in the head. Chiropractic care is so successful for headaches because the cause is being treated, not merely taking a pill and masking the pain. As a result of using the 2 minute headache removal technique for 30 years I published the book Stop The Headaches. It teaches you how to do what I do in the office but you can do it yourself at home or in the office. The bottom line about headaches is this. You don’t need to suffer.